The NCAA has won the most recent battle in the nickname controversy that has been brewing in North Dakota for the past decade, but the war isn’t over just yet. The Spirit Lake Sioux Tribe and one member of the Standing Rock Tribe lost in court earlier this month, when U.S. District Judge Ralph Erickson—a graduate of UND law school—threw out their lawsuit against the NCAA. The tribes had asked for $10 million and a reversal of the NCAA postseason ban on the Fighting Sioux logo and nickname. The NCAA had asked for the lawsuit to be dismissed on grounds that the Sioux tribe’s civil and religious rights were not violated. Erickson sided with the NCAA, infuriating tribe members who claim the Spirit Lake and Standing Rock tribes granted permission to the university to forever use its imagery as symbols of pride, honor and respect during a ritual pipe ceremony in 1969. 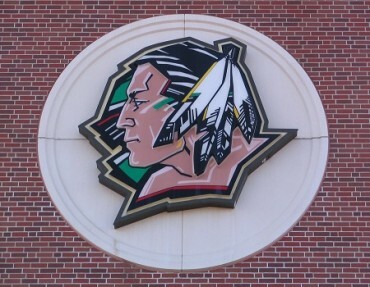 The University of North Dakota ‘Fighting Sioux’ moniker has been the subject of the debate over whether or not the nickname and logo are offensive to Native American culture. It has since spiraled into a heated legal battle including such parties as the North Dakota legislature, courts, board of higher education, the NCAA, and voting citizens. The NCAA entered the debate in 2005 when it included the University of North Dakota on a list of 19 schools that would be forced to change their “abusive and hostile” nicknames or risk sanctions. Following this, the university made plans to slowly retire the nickname, but since 2010, the university has been in a state of constant whiplash as lawmakers went back and forth between forcing the university to keep the moniker (which set them at odds with the NCAA) and forcing them to retire it (which set them at odds with an army of fans and members of the Sioux Tribe itself). In March, the university was forced to deal with the threat of NCAA sanctions when its women’s hockey team faced forfeiture if its players wore uniforms bearing the nickname or logo. The team ultimately wore blank jerseys to avoid punishment by the NCAA. The May 2 court decision in favor of the NCAA’s ban is unlikely to settle the issue for good. Frank Burgraff, a University of North Dakota hockey player and ardent nickname supporter, envisioned the debate continuing. On June 12, North Dakota will write the next chapter of the saga when usage of the nickname is put to a statewide vote. The NCCA has stated that if the state votes to use the nickname, UND teams will face penalties. Members of the media have identified members of the Native American community who do find the nickname offensive. But supporters of the nickname counter that some of them may not have the interests of the Sioux Tribe at heart. With the vote looming, the NCAA believes that the dismissal of the lawsuit may shift the momentum in favor of dropping the nickname. But if the citizens of North Dakota choose to keep the Fighting Sioux, the fight will go on much longer. Fix Contributor Blake Baxter is a student at Eureka College. Like The College Fix on Facebook.